CHICAGO (CNS) — When the relics of St. Pio of Pietrelcina — commonly known as Padre Pio — stopped at two Chicago churches, more than 19,000 people turned out to venerate them, organizers said. The relics, which included a lock of Padre Pio’s hair, blood from his wounds, a glove used to cover his stigmatized hands and part of his religious habit, visited St. Francis Borgia Church Sept. 25 and St. Ita Church Sept. 26. They were part of a national tour Sept. 16-Oct. 8 sponsored by the St Pio Foundation to mark the 130th anniversary of Padre Pio’s birth and the 15th anniversary of his canonization. 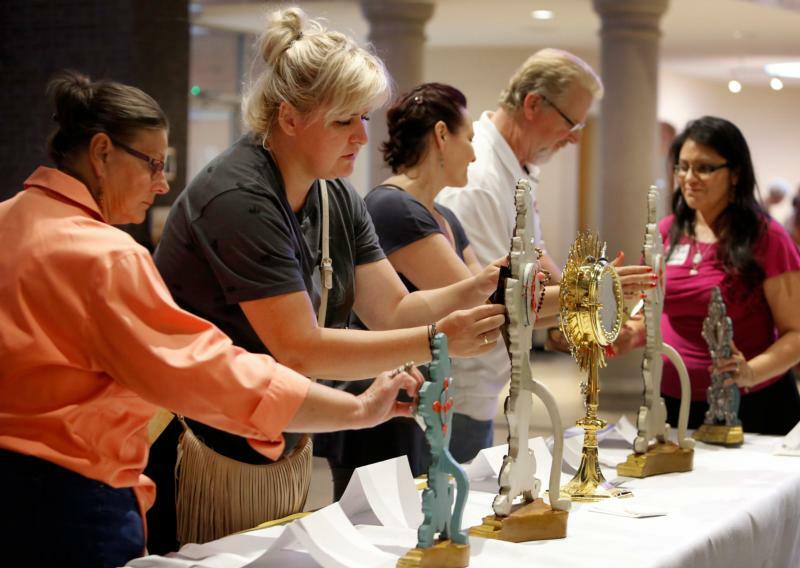 Almost a dozen U.S. dioceses and archdioceses hosted the relics. Born in Pietrelcina in southern Italy in 1887, Padre Pio was a Capuchin priest who, in 1918, received the stigmata — an occurrence where the five wounds Jesus’ passion appear on a person’s body. Those wounds stayed until his death. People flocked to Mass and confession with Padre Pio during his lifetime. He was known to have the gifts of bilocation (ability to appear in two places at once), healing and levitation. In 1956, he established Casa Sollievo della Sofferenza (Home for the Relief of Suffering), a hospital that today is considered one of the best in Italy. Padre Pio died in 1968 and was canonized by St. John Paul II in 2002. The tour of his relics began at St. Joseph Seminary in the Archdiocese of New York, and ended at Blessed Trinity Catholic Church in the Diocese of St. Augustine, Florida. The relics also traveled to the Diocese of La Crosse and the Archdiocese of Milwaukee in Wisconsin; the Diocese of Bridgeport, Connecticut; the Archdiocese of St. Louis; the Diocese of Saginaw, Michigan; the Diocese of Providence, Rhode Island; the Archdiocese of Atlanta; and the Archdiocese of New Orleans. In Chicago, those who turned out to venerate Padre Pio’s relics Sept. 25 and 26 all had a story to tell. Some saw him in person. Others knew someone who met the saint. Still others came across his story along their spiritual journey and pray to him fervently. For Carole Klein, it was a book belonging to her parents that was passed on to her after they died. Not a practicing Catholic, Klein read about the relics’ visit in the Chicago Tribune and stopped by St. Ita to see them. Her family talked often about the book while Klein’s parents were alive. “My daughter who’s 30 even knows about it,” she told the Chicago Catholic, newspaper of the Archdiocese of Chicago. The devotion to Padre Pio was evident in those who visited the relics along with her. “I’m not surprised by it,” Klein said. “You can see a part of him in this church in regard to his relics, whether it was a part of his person or something that he wore, something that he had,” Wiese said. St. Francis Borgia and St. Ita reported a steady stream of visitors from the time veneration started at 9 a.m. through the start of Mass each evening. They counted the number of people as they came in and priests blessed religious objects and heard confessions. During Masses each evening, the faithful filled all available space in the churches. They were in the pews but also in the aisles, the vestibule, on the street outside and, in the case of St. Ita, sitting on the steps of the sanctuary. Organizers expected large crowds but not quite the more than 19,000 who turned out. It shows the love people have for Padre Pio. “He’s truly a unique saint in the sense that he cuts across cultures, boundaries, ages and somehow resonates with such a wide group of people,” said Conventual Franciscan Father Bob Cook, pastor of St. Ita. However, the interest in relics doesn’t surprise him. “Relics are a reminder that the saints were human beings at one point. They’re still human beings but they are in heaven. With that comes everything that is human — temptation, forgiveness,” Cook said. Padre Pio was known to be short-tempered and, like many people, probably brought that up in his own confessions, Cook said. “He lived like we did and aspired to become a saint and did. That’s the route for all of us,” Cook said. Relics are also a way to keep in touch with heaven.